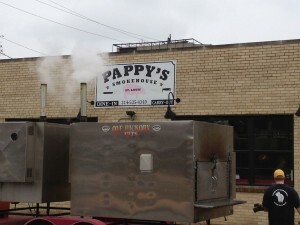 After two days of mediocre and disappointing meals I was beginning to lose faith, but I heard from several people that the barbecue was outstanding and so on a cold, snowy morning I trekked a mile and a half to Pappy's smokehouse. A large smoker, billowing white aromatic smoke was parked right in front of the restaurant and I thought to myself, this looks promising. I wish the menu offered some sort of combo plate but the minimum amount of ribs I could get was half a rack. Oh well. I got half a rack ($14) added a 1/4 pound of beef brisket for an additional $3. My plate came with two sides and I opted for the green beans and deep-fried corn on the cob. By the way, I want to know why St. Louis keeps deep fat frying previously healthy vegetables only to turn them into grease bombs. Deep fat frying the corn did not improve it at all - it made the kernels mushy and unappetizing. Luckily, the green beans had been simply boiled and dressed with butter and pepper. But vegetables are not why I made the long walk to Pappy's. It was for the ribs and they were glorious. They were thick and meaty, with deep smoky flavor, a hint of sweetness from the glaze and a kick of pepper at the end. They were certainly tender, but there was still a slight hint of chew to the meat which is exactly how I like it. I dare say these might be the best pork ribs I've ever had. The beef brisket was on the dry side and certainly nothing compared to the ribs. 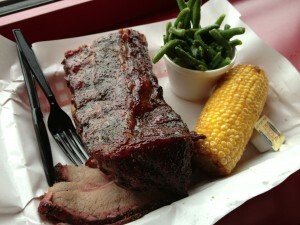 I know now I absolutely have to make it to Bogart's, the other BBQ restaurant in town. They have smoked prime rib. Upon my initial restaurant research I centered my efforts downtown but I discovered that the Metrorail is actually quite efficient and easy to use. Steve and I journeyed 4 miles to the Central West End, a small neighborhood near St. Louis University. Brasserie, as you would guess is a classic French brasserie. We started with a Bibb and herb salad. The dressing was delicious and I'd forgotten how important roughage to a diet. I was just happy that the lettuce wasn't deep fat fried. While we waited they brought us baguettes, screaming hot from the oven. I swooned at the perfectly crusty bread with the fine crumb. It's moments like those I think I could just live on bread and butter. Luckily, I don't have to because our entrées came and they were just as excellent. Steve got the steak frites and I got the mussels frites. His steak was cooked perfectly and tender and flavorful. My mussels were steamed in a classic white wine and onion preparation. My mussels came in a large shallow serving dish. 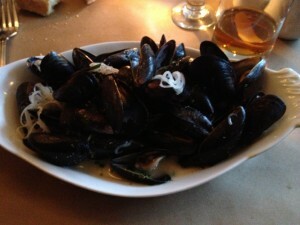 Frequently, they are served in a bowl or crock making it impossible to reach the broth until you are half done with the mussels. The broth is just as important to the dish as the mussels are. I appreciate this kind of thoughtfulness. I was worried that we would have too many fries as it came with both our entrées. I did not need to worry, as they were excellent. They were matchstick sized and golden, crispy and delicious. Mine came with a garlic aïoli that was a perfect dipping sauce. 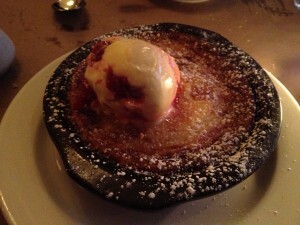 We were so full, impossibly full to have any dessert but as I pursued the dessert menu, far Breton caught my eye. It is a traditional dessert from the Brittany region of France and I've never had it before, I've only read about it. So in the name of science, I convinced Steve that we had to split one. It is somewhat similar to a clafoutis; Imagine if a custard and a crêpe had a love child. It came hot from the oven with a scoop of homemade brandied cherry ice cream on top. My cocktail was pear brandy with a salted caramel syrup - absolutely delicious. Steve thought his wine was "young," but enjoyed his excellent coffee with dessert. Our service was wonderful. Our waiter was extremely attentive and thoughtful. He brought me extra salted caramel syrup for my cocktail when I told him I like my drinks sweet. Several friends of mine went to Taste, a restaurant next door owned by the same chef and owner, Gerard Craft. They said it was excellent as well. If I lived in St. Louis I would certainly come back again and again to Brasserie.